The Kim Giak Low Choon Teochew Puppetry Troupe is led by master puppeteer Ling Goh. A third-generation traditional Chinese opera performer, Ling Goh could not resist the idea of having her own opera and puppet troupe. Her grandfather once owned an opera troupe in China, and her parents ran puppet shows. Ling Goh and her brother Goh Lih Shan soon began to acquire musical instruments, backdrops, stage props, exotic costumes and professional actors from China and Thailand. Thus, the Kim Giak Low Choon Teochew Puppetry Troupe was born. 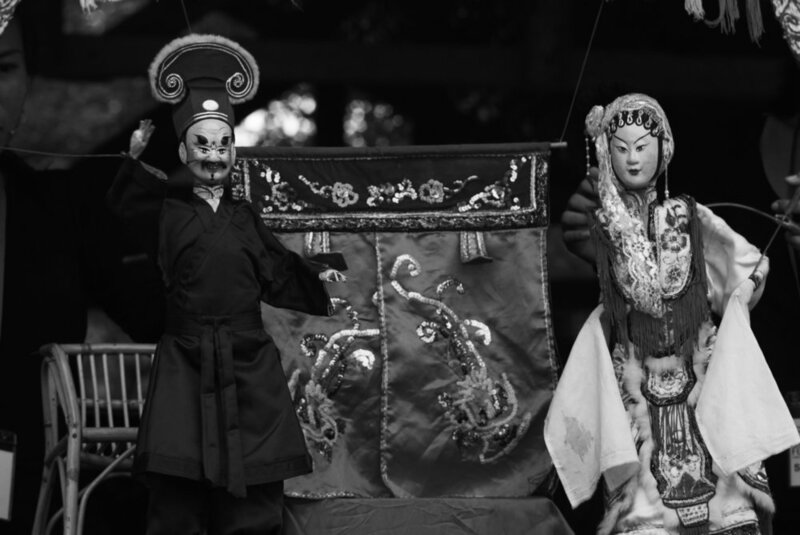 The Teochew Puppetry tradition of Penang is a distinct and increasingly rare form of puppetry that narrates folk tales and legends through a skillful play of marionette puppets. It is a more traditional and challenging form of opera, requiring fast and fluid animation of puppets to imitate human-like gestures. Traditionally, puppetry troupes consist of nine members divided into groups of three to handle puppets, sing and play musical instruments. The orchestra comprises of gongs, drums, er hu and cymbals. Each puppet takes about two to three weeks to make and are hand-crafted from wood, clay and paper, weighing several kilograms each. Older puppets are made of tightly-packed bundles of hay. The puppets are controlled by iron-rods attached to the back and limbs. Each character would have its own newly-made costume, richly detailed, just like those of a regular Chinese opera performer.